Once upon a time, I spent an afternoon (ok, many afternoons) procrastibaking instead of doing my actual work. Wait, you think, isn’t baking your actual work? That bad habit of mine just landed me in The NY Times. The New York freaking Times. Just in case you were wondering, I am laughing as I write this. I’m also eating a Brown Sugar Butter Crunch Cookie. Here’s the story: Two years ago I was in the middle of writing recipes for my book, Erin Bakes Cake. Instead of doing what I needed to be doing I decided to make scones and a giant donut. I had fresh blueberries! Can you blame me? I posted a picture of said baked goods and tagged it #procrastibaking. I finished writing the book (on time, THANK YOU VERY MUCH) and life moved on. About a month ago I got a direct message on Instagram from Julia Moskin, long-time NY Times food staff reporter. She was doing a story on procrastibaking. I should email her if I wanted to be interviewed. (I am still laughing about this. Of all the things, this is the thing?) Of course, I emailed her back. I didn’t truly believe that I would be interviewed by the NY Times, so I wrote silly things that made me chuckle and hit send. To my surprise she replied. She said there was, “great stuff here”. Come again? She also wanted to learn more about the toffee cookies that I mentioned were my go-to procrastibaking recipe. 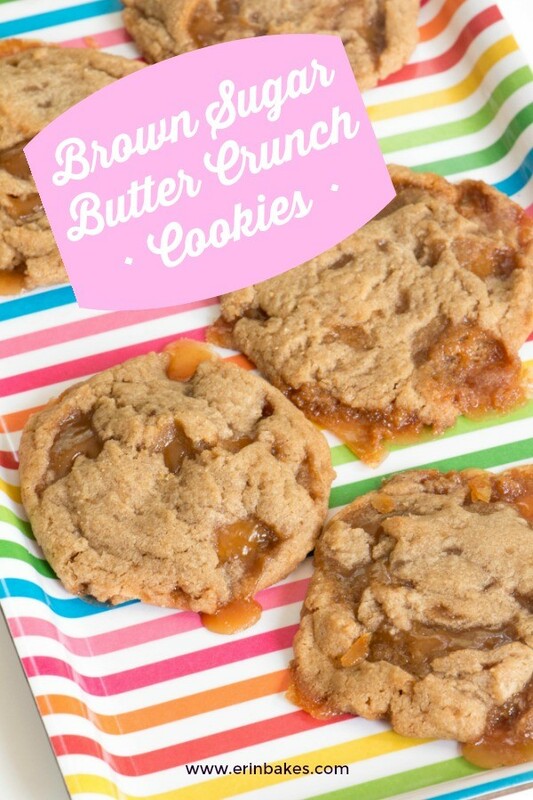 I call them “my toffee cookies”, but they are officially Brown Sugar Butter Crunch Cookies. That is the exact point I started to panic. I immediately made cookies, as one does. I then obsessed over the recipe and went through it with a fine tooth comb. I re-read it dozens of times. Were there too many commas? Not enough? (I have severe comma anxiety, FYI.) Finally, I decided it didn’t matter. If I have tasted anything delicious in my life it is these cookies. I’m confident to the point of cocky in that toffee recipe. I know it’s gold. Then she won the Pulitzer Prize. I wondered all weekend what kinds of things one does to celebrate winning such a prestigious award. Would she even have time to make the cookies? Would I ever hear from her again? What if weeks go by and I don’t hear back? Should I just assume she didn’t like them? OMG, what if she hates them and I’ve sullied one of the greatest professional moments of her life?!? Fortunately, I’m pretty sure the cookies didn’t ruin her life. She wrote back saying that she added the toffee to a Kitchen Sink Cookie recipe she had been working on for the Times and “everyone LOVED it.” SHE. USED. CAPS. That is a direct quote. She asked if she could call me for an interview and if someone could come to my house to take a picture of me for the piece. I told her I’d see what I could do. You know, move some things around and try to fit the them into my schedule. Actually, I tried to not sound like a puppy on a sugar high and said yes, that would be great. We chatted. She was lovely. I told her that I’m just liked a professional athlete. I was being funny, but you have to admit the analogy holds up. LeBron wouldn’t go into a game cold. How can I be expected to seamlessly move into recipe writing and tutorial development without a little warm up? I’m not a machine! That’s the story of how my big Irish melon ended up in The NY Times. Real the article here. Blow off whatever it is you’re supposed to be doing right now and make these cookies as fast as you can. Try not to eat them all at once. Procrastibakers unite! Julia Moskin from The New York Times adapted this cookie recipe to make her fabulous Kitchen Sink Cookies published alongside her article on procrastibaking. My original recipe is buttery, salty, crunchy, and rich with crisp pools of smooth toffee - basically everything you'd ever want in a moment of sweetness. In a small sauce pan, combine the butter, sugar, and salt. Cook over medium-high heat, whisking occasionally, until golden and bubbly, 5 to 7 minutes. Remove the pan from the heat and stir in nuts or seeds, if using. Pour onto the prepared cookie sheet. Allow the toffee to cool completely while you make the dough. Speed the process up by popping the sheet in the fridge to cool while you work. Position a rack in the center of the oven and heat the oven to 350 degrees F. Line a cookie sheet with parchment paper. In the bowl of a stand mixer fitted with the paddle attachment (or in a large bowl if using an electric hand mixer), beat the butter, dark brown sugar, corn starch, baking powder, baking soda, kosher salt, and vanilla extract until light and fluffy, about 5 minutes, stopping occasionally to scrape down the sides of the bowl with a rubber spatula. With the mixer on low, add the flour and mix until the dough is crumbly and still a little powdery. Chop the toffee into small chunks about 1/2 inch in size. Be careful to not chop the toffee too fine. The big, seemingly wrong, chunks are what make this cookie so special. Scrape the chopped toffee, tiny shards and all, into the cookie dough. Mix on low for just a few seconds to combine. Scoop .75 ounce (1 1/2 Tbsp or the purple dishes scoop) balls of dough onto the prepared cookie sheet, leaving 3-4 inches between each ball of dough. Bake for 9 minutes on the center rack. The cookies will appear puffy and not quite done with random toffee blowouts, but this is perfect. Allow the cookies to cool on the sheet before moving them, at least 10 minutes. The hot cookies will fall and crackle while the pools of melted toffee solidify. Move the cooled cookies to a plate or storage container. Repeat with the remaining dough. The cookies are best fresh, but cooled leftover cookies can be stored in an airtight container at room temp for 3-4 days. Layer the cookies with parchment paper if you live in a particularly humid area. Make this cookie recipe straight up or add your favorite nuts or seeds to the toffee. My favorite add-ins are sunflower seeds or pecans. Congratulations! What an awesome story. This cookie looks just like my favorite package cookie growing up in the suburbs of Baltimore. They are called the Butter Crunch cookie from a company called Linden and they came 3 to a sleeve. I live all the way in CA and dream about these sometimes! Definitely going to bake a batch this week to see how they compare. Thanks Erin! You’re way more than a cake decorator from NH. You’re a memory maker! A wish granter! A dream-out-louder! You’re too kind, Royela! I hope you enjoy the cookies!